Need a healthy option for Valentine’s Day? Try these Paleo Brownie Bites. Don’t be scared off by the term “Paleo”, these brownie bites are fudgy and satisfying. The Paleo diet is based upon eating wholesome food from the food groups that our hunter-gatherer ancestors thrived on during the Paleolithic Era. The Paleolithic diet consists mainly of fish, grass-fed pasture raised meats, eggs, vegetables, fruit, nuts and seeds and excludes grains, legumes, dairy products, potatoes, refined salt, refined sugar, and processed oils. These brownie bites require no cooking and are deliciously addicting. I won’t tell anyone if you eat the whole batch by yourself! 1 to 2 tablespoons unsweetened coconut milk or any liquid sweetener, like honey, agave, or maple syrup if you want your brownie bites to be sweeter. Pulse coconut in food processor for 30 seconds to a minute to form coconut crumbs. Remove from food processor and set aside. Place pitted dates in a bowl of warm water for a minute to soften them up. Add unsweetened cocoa powder and walnuts to food processor, blend until walnuts become fine crumbs, but do not over process or you will get some kind of chocolate walnut butter. Drain dates and place in the food processor with the cocoa walnut crumbs. Add vanilla. Process until mixture starts to combine. It may not fully combine until liquid is added. Add coconut milk or liquid sweetener (if desired) half a tablespoon at a time. Pulse. I used a combo of raw honey and coconut milk. You will know the consistency is right when the dough combines into a ball in the middle of the food processor. If dough is too runny add a tablespoon or more cocoa powder to bring it back to a dough like state. Transfer dough to a bowl and cover with plastic wrap. Refrigerate for at least 2 hours. Cold dough is much easier to work with. I left my dough in the fridge over night. You could put it in the freezer if you need to speed up the process. This recipe makes 12 – one inch balls. 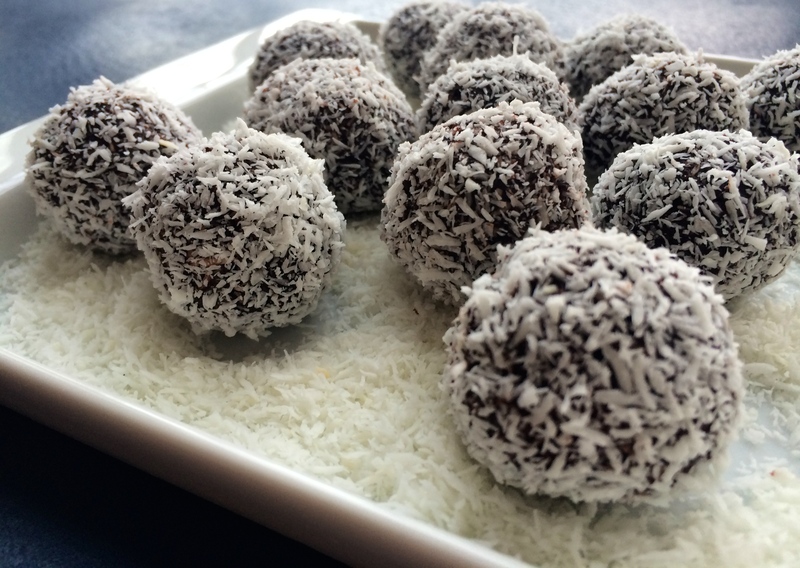 Once you roll the brownie balls, roll them in the coconut crumbs. Store the bites in the refrigerator. They look delicious! I love the fact that they are respectful to our ancestral diet. I have tweeted your blog and recipe to my many Paleo followers as well as posted it on my Facebook Training page. Thanks, Pam! you are so funny. very cool and look so yummy. Ate them last night and they were delicious !